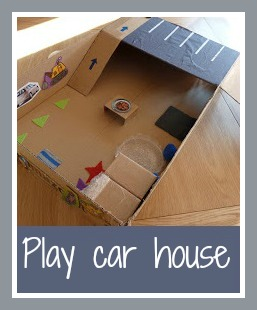 I have fond memories from primary school of making little rooms inside shoe boxes. I can't remember the context, but I loved decorating the inside of a box with pictures cut from magazines, adding in little pieces of furniture and so on. I'm looking forward to doing this someday with Harry and Mia, but I think that they are a bit young for this at the moment. I made a covered section at one end, marked out to form a car park on the top. There is an internal ramp, and a larger ramp up the outside, which folds over for storage. There is a small door at the front and the back, and Harry has stuck pictures of cars from magazines to the outside. That would probably have been enough, but I couldn't stop there. I used two smaller boxes to make a car wash and drying area in the corner, then I added some pictures for the walls, a mirror from tin foil, a bed and some cushions. In the middle is a little table which they can drive up to, and the cars also have a hot tub and rug. 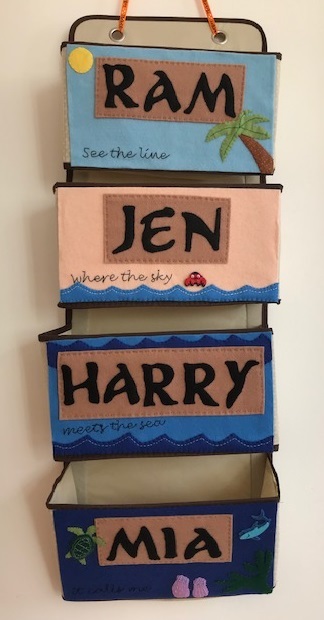 This was a fun project because Harry was able to get involved with the sticking and suggesting things that he might like to add in. I think that he was a little bemused though ("cars don't need chairs, they don't have bottoms!") but he indulged me, and it has had a lot of play! I have been thinking of making a car ramp type thing. Big man has still kept his puppet theatre that I made him last year.